So here we have a paranormal Victorian story where the protagonists are a Black man and a woman of South Asian descent. Both of their stories are constantly informed by their experiences. 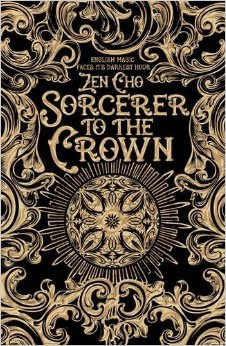 Zacharias is the Sorcerer to the Crown, technically the most powerful magician in the country but constantly faces derision, rebellion and open attacks against him because he is Black. The other wizards, despite his obvious skill and patience and impeccable manners, constantly regard him as less than them, as little more than an animal and wholly unworthy of his position. They scapegoat him for any and all problems they’re facing (including England’s declining magic). Zacharias constantly shows how wrong they are with endless patience and restraint and skill. While his rivals constantly seek their own power and advancement, it’s Zacharias who worries about the actual future of English magic, how their infighting may turn the country against them and how their infighting may jeopardise the treaty they have with the French Sorcières. Even though he doesn’t want the job he performs better than his predecessor and certainly better than any of his competitors. At every stage and at every moment it’s clear that his racist detractors are beyond wrong and clearly Zacharias’s inferiors. But even beyond the constant derision and attacks Zacharias faces, there are other more complex depictions and challenges of racism. His complex relationship with his mentor, Sir Stephen, is definitely one of them. He clearly cares for the man who definitely cared for him, helped him and championed him – but he equally recognises that the man who freed him from slavery did nothing for his parents and at least in part treated him as a Pigmalian-style project, a curiosity even if he did also value him as a son. The affection doesn’t blinker him from the reality of his situation. I also very like that he hasn’t completely bought into the whole ideal of British wizards. Their idea of duty is, ultimately, very self-serving – it empowers themselves, it empowers their nation, it doesn’t care about either individual freedom or peace or safety or health – and it certainly doesn’t care about other nations. Zacharias has a compassion above and beyond that, even if it makes him a traitor to his position in St Stephen’s eyes and even if it wars with his own sense of duty. He has a morality that goes deeper than his duty and has to be seen through the lens of him being a permanent outsider. Like Zacharias, Prunella does an awesome job of showing how ridiculous this is by being unfailingly awesome. She is definitely the most skilled magic user in the whole book and she has massive wells of power – and skill not just beyond her competitors but also skill that goes beyond what learned English thaumaturgy can manage. She comes from an ancient and powerful tradition of WOC magicians and she kicks arse. In addition to that, she’s immense fun. While Zacharias is more deep and sad and a little tragic, Prunella is also snarky and tough and fully aware of the silliness of the society around her and, more, she’s quite ruthless. She knows what she wants and she’s going to get it and she isn’t going to let the false rules of a society that doesn’t come close to valuing her hold her back. She’s funny, she’s awesome and she is pretty much centred to be the main character for future books in the series and I’m more than OK with that. This book goes further than challenging the prejudices of this world than simply having 2 protagonists that prove them wrong. We have repeated other challenges – women are considered frivolous in their use of magic? What about drunken thaumaturges using magic for pretty fireworks? Besides, women are only allowed to use magic in very limited circumstances and, for upper class women, that’s nearly entirely limited to appearance – how are women frivolous by using the only means available for them? British magic is superior – yet here we have a Chinese wizard who has clearly mastered concepts that British magic has arrogantly and inaccurately dismissed. Here we have an Indonesian witch with enough power to make everyone step back – and that also adds on to colonialism. Rather than just present a standard reflection of our world, we have empire being challenged because in a world of magic, military might alone does not ensure control and even a small nation can have surprising power and influence. On top of this we also have some excellent nods towards class – with women’s magic being vilified, except among servants who can use cantrips to help their domestic duties in serving their betters. Or how one of the defining features of a thaumaturge in Britain is not just being a man – but a gentleman. Magic is the province of the wealthy and privileged – and is constantly confined just to those with the most power and influence. The treatment of minorities in this book is excellent – except it’s another book with a complete erasure of LGBT people. I’ve spoken a lot about the treatment of POC, women and class in this book – but they are truly the awesome elements that really make this book shine. But they shine because these characters are so well developed and happen against a backdrop of a fascinating and complex world with immense potential. I really love the detail of this world and, on top of that, all of his excellent complexity and detail is excellently portrayed. No clumsy world building, no awful exposition, no terrible convoluted dialogue – just this amazingly rich world and really fun, deep characters all portrayed with excellent writing that kept me engaged and enthralled throughout – and a story that continually went in unexpected directions and kept plenty of twists right until the end. Honestly, it’s almost a shame that the characters are so awesome because they overshadow the excellent story and world so much which are also well worth praising. It’s an awesome book and above that has some truly amazing characters. Bring on book 2, I want to see Prunella take the world by storm with Zacharias at her side.